Petrov-Vodkin is a Russian and Soviet artist, graphic artist, art theorist, writer and teacher. They brought accidents to his art, like many artists – first he met two icon painters, watching whom he felt a desire to take up the brush, and after his mother slipped his son’s drawings to a famous sculptor who was so impressed with the work of Petrov-Vodkin that he took him with him to St. Petersburg and gave a brilliant education. If it were not for these two cases, who knows how his creative destiny would have been. 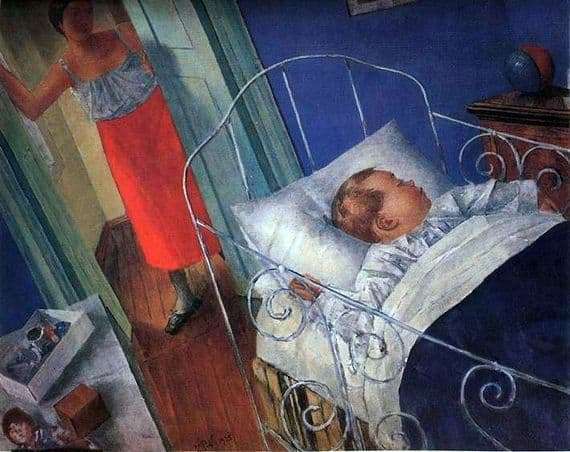 “In the nursery” is one of the paintings devoted to motherhood, which Petrov-Vodkin, in a certain period, sang with all his works. On some, he put holiness and incomprehensibility into him – as in the “Petrograd Madonna,” for example – in others he showed how ordinary motherhood was and how sacred it was at the same time. “In the nursery” – from the second. Sleeping baby in the crib. Turned away from the viewer, the handle is compressed into a cam, the hair is marked with light strokes, which give them fluffiness. Assembled toys, packed in a box, put on a bedside table. The blue blanket covers the baby. Mother stands in the doorway – she is dressed simply, the emphasis is on her very figure, frozen in the doorway. This figure is large, the picture is slightly sloping diagonally, as if it pushes a glance towards it. With her hand, the woman adheres to the joint, with the second hand she prepares to close the door, and on her face is a tired tenderness. She played with the child all day, walked with him, fed him and taught him, and when he fell asleep, she felt relieved and at the same time a strange emptiness. Her face is slightly puzzled, as if she does not understand why she is bored, why sad, why lonely without a baby. In the next moment, she closes the door, goes to the TV or the kitchen, but still from time to time will look into the nursery, which turned into a sleepy kingdom. Will make sure her son is fine.